This piece was my first attempt at an "art" quilt. It was my attempt to portray in fabric that lovely, lilting song called the Pachelbel Canon in D. I heard it for the first time as I first held my first son, Michael, in my arms at the hospital, after going through an unexpected Cesarean operation. He was so beautiful, the music so lovely, I got this vision in my head that just wouldn't let me go until I created it. This piece was my second attempt at an "art" quilt. I had learned a lot from the first one, mainly that I needed a lot more contrast and drama in the piece, that the colors should be more varied, and that it needed some shimmer and gleam. Unfortunately, I gave this one away without making two at once. One day, when I have nothing better to do, I may recreate this piece, just because I want it. I’ve been thinking a lot lately about the “Art Quilt,” and have pretty much come to the conclusion that almost all quilts are art quilts. 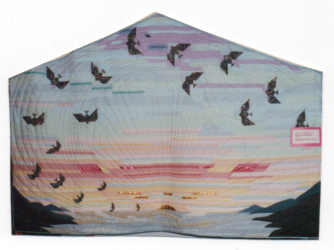 Think about how quilts affect you, then think about what Art is. Art is more than the sum of its parts. Art is “an elusive combination of rare skill plus imagination.” Art is something “like hearing dark green, or catching a glimpse of a musky scent, or smelling the tinkle of golden bells.”  Art touches you someplace you can’t see, and heals a hurt you didn’t know you had. Art “MOVES you from where you are to SOMEPLACE ELSE.” Art stretches you like a rubber band so you can’t quite ever go back to being the way you were. Most quilts affect me that way, whether I am the maker or not. Think about it. Most quilts are made from fabrics that speak to you in some way - maybe they were part of your daughter’s first dress, or your son’s first overalls. Maybe the fabric came from Grandma, or a friend’s stash, or maybe you got it on a trip to someplace far, far, away, and the memories linger. Maybe you bought it all new, but it was the first time you ever tried to make a quilt without a pattern, or as you were working on it, some great good or bad news came - the birth of a child, the death of a close friend, the beginning or the end of one of man’s endless struggles against man. Being made over time, quilts can’t help but contain the thoughts and memories of the times they endure through, and the times they were made for. All quilts, it seems to me, are caught up in some kind of memory and time warp, so that those thoughts and events return to the us whenever we look at that particular quilt. Other people looking at your quilt will see different things, different times, different meanings - and that’s okay. You can tell them why you made it and where the fabric came from, but their own mind and times will layer meanings upon that meaning, for each person experiences art in different ways. 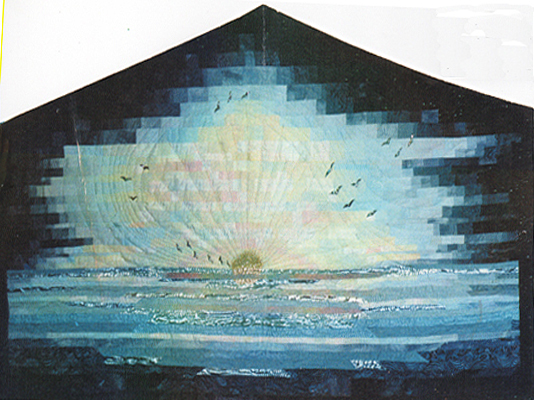 Maybe your quilt looks more like a sailboat to them than the waterfall you intended to portray. Maybe it will call back memories of their own childhood, or bits and flashes of poetry, or the feel of a feed sack or the taste of hot chocolate on a cold winter morning. Just as you can’t really explain why a painting touches you, or why a bar of music grabs a piece of your heart, so you can’t really say why one particular pattern of cloth and color touches a chord in your soul. Just like with other Arts, there are going to be pieces you don’t like, and that’s okay. I’ve been to shows where I can’t help thinking “Why on earth would someone make that ugly thing?” or “This woman has far too much time on her hands;” heck, I’ve made a lot of quilts like that. But it just doesn’t matter that I didn’t personally like those quilts, for someone, sometime, someplace, those quilts were, are or will be something important. Sometimes it’s enough just for someone to know you cared enough about them to make them a quilt, no matter how the quilt turned out. Quilting is a difficult art medium to work with - harder than painting or photography or many other art forms, it seems to me. Quilting is painful - we step on pins barefoot and cut our fingers and burn our hands and spend lots of money (which is painful to a Minnesotan). Quilting is frustrating, too - needles break, thread twists and knots, fabrics fray and run, pieces refuse to lie flat, we can’t find the right fabric no matter how many shopping trips we make and then - at the worst possible moment - we have to stop, leave the whole mess and DO something about dinner. But what is Art without a little adversity? Oh, there are the golden moments - when we get to work in peace and quiet, when the colors blend perfectly, the machine quietly hums along doing its own little mantra, and our vision slowly, slowly becomes reality, but these times are few and far between. Why do we put ourselves through this? I think it’s because quilting is Art, and because it is Art, we can’t not do it. Oh, I have tried to get out of it. I told myself, “Self,” I said, “that quilt you want to make is just too complicated. It’s going to be too much work, you don’t have the time, you don’t have the right fabric, and furthermore, you don’t have the skills and know-how to do it right.” It didn’t make any difference. By the time I admitted to myself that I really was going to take my somewhat questionable creative talents, a heap of expensive fabric and a considerable portion of my life making this quilt, it had sprung to life in my inner vision, and all I had to do was reach in and pull it out - fully formed. Somehow or other, sooner or later, I found the time and the fabric and took classes and figured out how to do it, anyway. And so do you. So, don’t let anybody call your quilting “Mom’s little hobby.” Don’t let anyone diminish what you do and who you are, because you are important. You are doing something worthwhile, something creative, and it’s worth every penny you spend on it, every moment you spend dreaming about it; for quilting is your ART, and you can’t not do it and remain true to yourself. Sometimes you can’t help it - quilting has to take a back seat for a while. Every now and then, I have to work full time at my day job for some reason or another, and I get caught up in it and don’t sew for weeks at a time. It’s awful. First I get crabby. Then I start housecleaning in my free time, instead of sewing. The kids get mad at me because I get mad at them because they’re making a mess (as usual). When I’m quilting, I don’t notice the house falling apart; that trail of fabric across the living room just seems to blend into the general ambiance. When I work full-time, my creativity disappears, I don’t really CARE who’s having a fabric sale, and my daughter can actually talk me into going SHOPPING, which I detest. I don’t get too worried, though, and neither should you, because you know the vision of your next quilt won’t go away, it will simply keep getting stronger and clearer until you DO have the time to get back to it. The fabrics, by then, will simply LEAP out of the stash onto the design wall, and you won’t be able to stop them. And when this happens, you know it’s ART. James H. Schmitz, The Witches of Karres; He was talking about relling a vatch, but I think the description is an excellent one for art.